new EP available - first tracks released since 2006! Reunions are rare in jazz. In pop music they’ve been omnipresent since the early 2000s, at times happily revisiting the biggest cultural misadventures. Don’t expect that kind of nonsense with the prominent lineup of Human Feel. An acerbic fusion of chamber music, free jazz, and alternative rock, it first emerged back in 1987 in Boston and remains true to it’s original intent to this day. After its founding by saxophonists Andrew D’Angelo and Chris Speed together with drummer Jim Black, guitarist Kurt Rosenwinkel joined in 1990. The ensemble had gone to New York, where they were so loved by the flourishing Downtown scene that it cost them there life. One by one, the members of Human Feel were recruited by artists like Tim Berne, Dave Douglas, Uri Caine, John Zorn, and Ellery Eskelin. In Human Feel, this reliance on the rhetoric of the subconscious creates an authenticity that develops its effect despite the many genres touched upon. Only subjective truth is valid here. Its sum is the basis of the fascinating erratics of this company that is so flexible from an intellectual perspective. 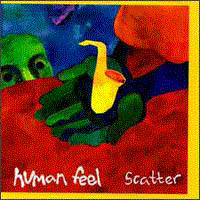 Human Feel brilliantly softens rock riffs an expands the limits of chamber music with furious force. This is the first time the ensemble has reunited in a few years and there’s plenty to look forward to since this music contains truths that can be stimulated, even in the case of the most anemic listener.